Anna Bolton is the Cleveland Indians’ Spanish translator. Photo by Dan Mendlik. Anna Bolton dodged the cooler of Gatorade aimed at Cleveland Indians shortstop José Ramírez, but she couldn’t avoid the cooler of water that followed. “Bienvenida al equipo,” Indians’ shortstop Francisco Lindor said. Welcome to the team. Soaking wet but undaunted, Bolton (Spanish ’07, M.A. Spanish and second language education ’08) carried on in her role as the Indians’ Spanish translator by working with Ramírez, who was being interviewed about his game-tying home run at that game in August 2016. Anna Bolton joins in the celebration of clinching the division this year. Photo by Dan Mendlik. An Indians fan while growing up in Winston-Salem, North Carolina (her cousins were from Cleveland), Bolton has been building toward this job ever since she first went to the Dominican Republic at age 15. The dream position got even better in 2016 when the team played in the World Series. Bolton’s father, Jon Bolton, pitched for Wake Forest University in the 1970s, and so he raised her to appreciate baseball, as well as football, soccer, and basketball. The Dominican Republic connection started in high school when she took three church mission trips and then returned after high school. Another part of the attraction to Tech was its study-abroad offerings. Bolton spent her junior year in the Dominican Republic and Costa Rica. While she was in Blacksburg, she took a class called Crossing the Border Through Service-Learning and was a student assistant for Kris Tilley-Lubbs, the Spanish professor who was responsible for the service-learning class. 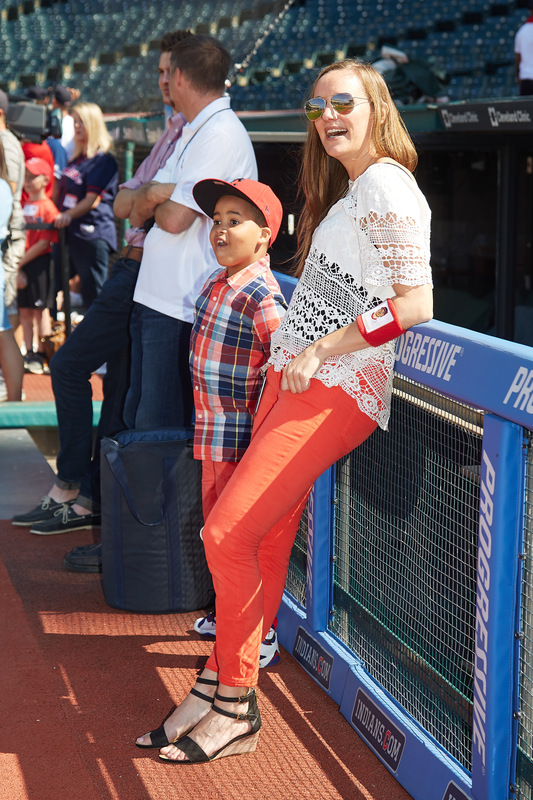 Anna Bolton joins David Santana in marveling at one of his dad’s (Carlos Santana) batting practice moon shots. Photo by Dan Mendlik. During her senior year, Bolton enrolled in graduate school while finishing her undergraduate degree, which led to student-teaching English to speakers of other languages (ESOL) in Roanoke. She also made a connection with Stephanie Sebolt (M.A. ’91, Ph.D. ’10, both in curriculum and instruction), who was teaching English to the players for the minor-league team in nearby Salem, Virginia. Bolton went on to teach ESOL (ESOL involves culture and skills needed as well as the language) and dual language kindergarten and first grade before signing on to teach ESOL in the Indians’ Dominican Republic Academy. The academy is a stop for the Indians’ 35 or so international players preparing to move into the minor-league system in the United States. Current Indians players Bolton taught and then proudly watched flourish include José Ramírez, Erik Gonzalez, and Danny Salazar. She also ran children’s programs and frequently traveled to Haiti to participate in earthquake relief efforts. When the Indians opened a translator/interpreter spot in 2016, she applied and was hired. In addition to assisting players, she believes she helps fans understand them better. Indians player Carlos Santana and Anna Bolton hug immediately after the Indians wrapped up the 2016 American League Championship. Photo by Dan Mendlik. Bolton’s top moment so far? The night the Indians won the American League Championship to go on to the World Series. “There isn’t a better group of guys in professional sports, and the joy that we all shared that night in Toronto was incredible,” Bolton said. Written by Richard Lovegrove, this story originally appeared in Virginia Tech Magazine.